» 2014 » September The Rev. Wil Gafney, Ph.D.
J. K. Gayle’s response to my address interweaving my (much) earlier work on translation theory as it pertains to the scriptures from a black feminist perspective. Collect: O Fire of Love by whose grace your servant Hildegard, kindled with the fire of your love, became a burning and shining light in your Church: Grant that we also may be aflame with the spirit of love and discipline, and walk before you as children of light; through Jesus Christ our Redeemer, who lives and reigns with you, in the unity of the Holy Spirit, one God, now and for ever. Amen. the frame of the heavens manifests their majesty. a wondrous instrument, the work of the Most High. ruler of the ends of times, an everlasting sign. and now it delights in its course. is a sparkling witness in the heights of God. never relaxing in its watch. for its splendor is glorious. and the hand of God has stretched it out in might. 28 Where can we find the strength to praise God? For God is greater than all God’s works. *Verses 1-2, 6-7, 9-12 translated from the (Hebrew) Masada manuscript, MasSir. Verses 27-28 translated from the (Greek) Septuagint. and Leviathan, this one that you formed to play in it. you open your hand and they are filled with good things. touches the mountains and they smoke. I will sing praise to my God while I endure. for I, I rejoice in the Majestic One. *Translated from the (Hebrew) Masoretic Text corrected against Dead Sea scroll manuscript IIQPsa. ✝Translated from the traditional Nesle-Aland (Greek) text consulting the (Syriac) Peshitta. This Holy Eucharist will conducted as Rite II (beginning on p 355), shaped by the language of Hildegard of Bingen (in italics) who we celebrate today. You are welcome to pray the traditional language found in our prayerbook or to expand it following the example of Hildegard. Blessed be God: Creator, Christ, and Compassion. And blessed be [God’s dominion], now and for ever. Amen. Omnipotent God, incomprehensible in majesty and inestimable in mysteries, to you all hearts are open, all desires known, and from you no secrets are hid: Cleanse the thoughts of our hearts by the inspiration of your Holy Spirit, that we may perfectly love you, and worthily magnify your holy Name; through Christ our Redeemer. Amen. The Living Light be with you. O Fire of Love by whose grace your servant Hildegard, kindled with the fire of your love, became a burning and shining light in your Church: Grant that we also may be aflame with the spirit of love and discipline, and walk before you as children of light; through Jesus Christ our Redeemer, who lives and reigns with you, in the unity of the Holy Spirit, one God, now and for ever. Amen. In the name of God: Majesty, Mercy and Mystery. Amen. In 1098, the One Who poured the good and sweet intelligence into humanity (as she would one day write), midwifed Hildegard – later of Bingen – into the world. Eight years later she began her education at a monastery. Ten years later she became a nun. Another decade, another vocation; at 28 she became the abbess. For four years she received a series of visions. Out of those visions she wrote 72 songs, 70 poems, nine books – including a commentary on the Gospels and one on the Athanasian Creed—and a play. Her writings combined science, art and religion. She was a preacher, traveling to France, Germany and Switzerland to proclaim the Gospel. She was a social critic and reformer of the church, writing popes and emperors to correct and guide them. Her exhortations were full of her concerns that the downtrodden be freed from crushing poverty and that every human being, made in the image of God, had the opportunity to develop and use the talents that God has given her to realize her God-given potential. She also knew something of architecture and engineering, when she moved her nuns to their own monastery, one without an attached men’s monastery, she ordered pipes to bring pumped water into the facility, a rather newfangled idea at the time. A Doctor of the Church, she joins Catherine of Sienna, Teresa of Avila and Thérèse of Lisieux among the male worthies. I celebrate her for the language she found and crafted to communicate her visions. In her honor I sought to translate the scriptures and the rubrics of prayer in language worthy of her. Inspired by her scholarship I employed my own, discovering the oldest manuscript of our Sirach lesson was the Dead Sea scroll from Masada, so naturally I translated that. 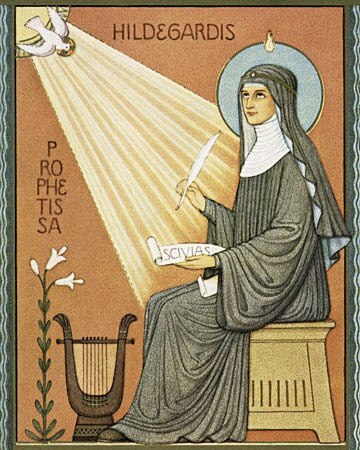 Hildegard’s glorious visions bear witness to both the inadequacy of human language to describe the God Who rules the whole world with celestial divinity in the brilliance of unfading serenity and the unplumbed potential of our language to translate something of the mystery of the Celestial Majesty. Like Sirach and the Psalmist before her, Hildegard saw in nature a lexicon for the Divine. And though she often used male pronouns and masculine imagery like the scriptures, like the scriptures she did not limit herself to them. Life, within the very Life of all Creation. Holy you are in giving life to All. with a fine aroma of virtues. and inquired after the lost. enfold those who offer blessing. whom Divinity wishes to save. you compose All, you unite All. and the earth exudes Life. bringing joy through Wisdom’s inspiration. bequeathing the reward of Light. It frustrates me to no end that a medieval woman and Iron Age scriptures are more expansive and inclusive in their language for God than my own church and prayerbook. May we finally learn the lesson Hildegard offers, that our God is…the living God, ruling over all things, shining bright in goodness and with wondrous things in God’s works, whose immeasurable brightness in the depths of God’s mystery no single person can gaze at perfectly. In the name of God: Divine Love, the Eternal Beloved and the Faithful Lover. Amen. Almighty God the Just Judge have mercy on you, forgive you all your sins through our Redeemer Jesus Christ, strengthen you in all goodness, and by the power of the Holy Spirit keep you in eternal life. Amen. The peace of the Gentle One be always with you. Offer yourselves and your gifts to God who is holy, giving gifts to all. The Living God be with you. We lift them to the [Lord]. Let us give thanks to the Eternal One our God. It is right to give [him] thanks and praise. It is right, and a good and joyful thing, always and everywhere to give thanks to you, Almighty and Ineffable God, Who was before all ages and had no beginning and will not cease to be when all ages are ended. We give thanks to you, God Who is true Love, for the goodness and love which you have made known to us in creation; in the calling of Israel to be your people; in your Word spoken through the prophets; and above all in the Word made flesh, Jesus, your Son. For in these last days you sent him to be incarnate from the Virgin Mary, the sacred matrix, to be the Savior and Redeemer of the world. In him, you have delivered us from evil, and made us worthy to stand before you. In him, you have brought us out of error into truth, out of sin into righteousness, out of death into life. At the following words concerning the bread, the Celebrant is to hold it, or to lay a hand upon it; and at the words concerning the cup, to hold or place a hand upon the cup and any other vessel containing wine to be consecrated. And we offer our sacrifice of praise and thanksgiving to you, O God the Ruler of all; presenting to you, from your creation, this bread and this wine. We pray you, Living Fountain, to send your Living Spirit upon these gifts that they may be the Sacrament of the Body of Christ and his Blood of the new Covenant. Unite us to your Son in his sacrifice, that we may be acceptable through him, being sanctified by the Holy Spirit. In the fullness of time, put all things in subjection under your Christ, and bring us to that heavenly country where, with [Hildegard and] all your saints, we may enter the everlasting heritage of your daughters and sons; through Jesus Christ our Redeemer, the firstborn of all creation, the head of the Church, and the author of our salvation. By him, and with him, and in him, in the unity of the Sacred Spirit all honor and glory is yours, O Wondrous Wonder, now and for ever. AMEN. The ministers receive the Sacrament in both kinds, and then immediately deliver it to the people. Let us pray using the form on p 366. Let us go forth in the name of God, the magnificent, glorious, and incomprehensible.